A young deaf woman wanders the streets of Kampala and learns the dangers of living on the streets. Administrator. “Cleopatra Shines through Yogera”. The Observer, 29 Aug. 2010. Web. 7 Apr. 2015. Ssemutooke, Joseph. 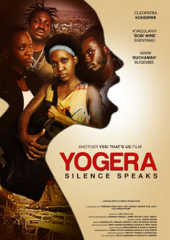 “Rabadaba, Miles Steal Show At ‘Yogera’ Premiere. AllAfrica Global Media, 22 June. 2010. Web. 9 Apr. 2015.